Have you heard of a little thing called a lead magnet? It’s the free gift or offer that you give subscribers to entice them to join your list. You’ve been led to believe that if you create a lead magnet, subscribers will come from near and far to join your list, but that’s not true. And, it’s not enough to attract the right subscribers. Targeting allows you to hone in on the attributes (demographics, psychographics, etc) that most align with your ideal client. Smart Insights reviews six targeting options in detail here. Just like it’s important to identify your target market in business; it’s important to determine your ideal subscribers when building your list. Before we dive into the key characteristics of your ideal subscriber, we need to take a step back. Think about your ideal clients and customers. Who do you want to work with, fill your programs, join your membership site and consume your info products? These are the same people that you want to add to your email list. Remember, your email list is a tool to build relationships, build community and make offers that add value to the lives of your ideal clients. In order for you to get visible, grow your following and build a list that matters, you want to get to know your ideal clients’ needs, wants, desires and challenges intimately. 1, It will help you pinpoint where you want to focus your energy. You'll want to collaborate with other business owners who service this market and comment on relevant blogs. 2. It will also help you focus and align your list building and marketing efforts so you are spending time only where your target market hangs out. You can do this by creating a simple survey and asking them. If you’re just starting out and you don’t have access to your ideal clients, you can use one of the following tools to determine their pain points. 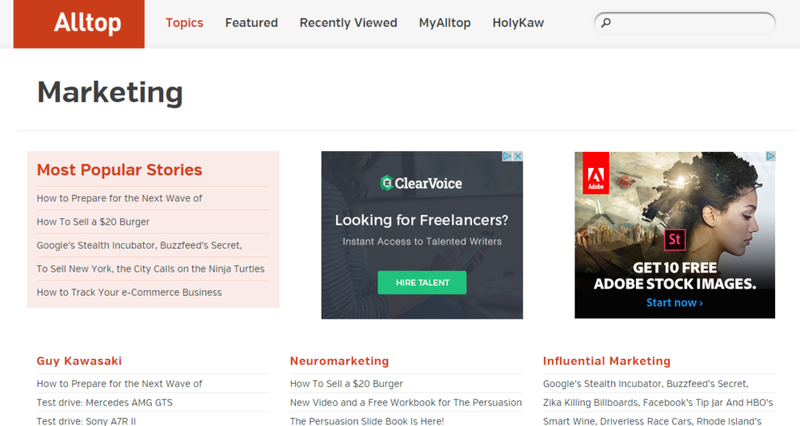 My favorite tool to use is AllTop.com which lists out all the best blogs in every industry. It also makes it super easy for you to spy on your competition (review the topics and comments shared to determine your ideal clients’ challenges). Similarly, you can use a tool like Quora.com to search for common questions/pain-points in your target market. Now that you know your ideal client’s top challenges, needs and fears, you’re ready to create a lead magnet that offers a solution and positions you as the expert to help them. (No lead magnet? No time like the present. Take a peek at my Must-Have List Building Tools to help you put your lead magnet together faster and easier). Go where your ideal clients are hanging out. They’re everywhere. If you think they’re hiding, you’re probably not looking hard enough. Chances are your ideal clients are there too. Identify 3-5 groups and show up. Share your content and knowledge regularly. And, don’t forget to share your lead magnet. Suzi at Start A Mom Blog has compiled a database of Facebook Groups. Search for your ideal clients in Google Plus communities. Go to Google Plus and then use keywords to find groups where your ideal clients are hanging out. For instance, if your ideal client are women between the age of 18-34 who love the Hunger Games trilogy, you might want to join the Hunger Games community. If your ideal clients want to learn more about social media, you might join Kim Garst’s community, BOOM. Create an account and start to be of service. Start a thread to spark some conversation. Answer questions. Are you a big fan of Slack? Your ideal clients could be in these communities as well. Nora Conrad runs Nora Conrad Community (free) and Caressa Lanae runs Spark to Launch (paid). Both cater to entrepreneurs and have a strong female presence. Now that you’ve found your ideal clients, it’s time to turn them into subscribers so you can start building the relationship. You can invite them into this relationship by promoting your lead magnet. Take a moment and tell me which community you plan on joining to share your knowledge and promote your lead magnet. And remember, it’s ok to start with one.